Continental Metal Products manufactures high quality stainless steel healthcare equipment for hospitals. Tag Archive | "Pass Through interlock"
Continental Metal Products’ Pass-Through Medical Cabinets for Hospital Operating Rooms and Hospital Pharmacies are now available with an Electronic Interlock System. 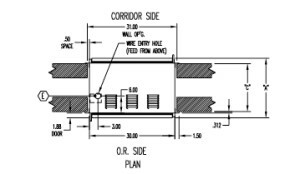 Pass Through Cabinets Interlock assists in meeting USP 800 and 797 guidelines. The Pass Through Cabinets Interlock system maintains that there is no air exchange between the operating room and the sterile core as well. CMP’s Pass Through Cabinet Interlock Interlock system prevents either door from moving when the opposing door is open, protecting your OR environment or hospital pharmacy anteroom during material transfer. In this way, insuring that the interlocked door cannot be forced open. CMP’s exclusive system’s strength, resists up to 500 lbs. of force. These double interlocked doors maintain air pressure differentials. Supplies are easily transferred from the sterile core to the operating room, as well as through the compounding pharmacy. The pass-through chambers minimize the need for movement between working areas and Buffer rooms, Chemo, and IV in Hospital Pharmacy Anteroom. Continental Metal Products now offers an exclusive Pass Through Cabinet Interlock System, to lock the opposing doors in our Pass Through Cabinets. This system is operated via a circuit board controller and is much more reliable than mechanical style systems. CMP’s Electronic Interlock System utilizes updated, state-of-the-art technology that insures superior operational functionality as compared with the mechanical interlock systems of the past. This fail-safe design immediately locks the opposing door with a more secure seal. Old fashion, mechanically interlocked systems do not hold as tightly. Many hospital pharmacies and operating rooms are finding our exclusive electronic interlock system extremely valuable. For x-ray protection in Hybrid ORs they are utilized with Lead lined pass through cabinets. Fire rated cabinet options are available to meet state and local fire marshal codes. Self closing door options can be specified in all Pass Through Cabinet models. LED lights improve viewing capacity though the large hinged thermopane glass panel doors. Glass doors contain ¼” thick safety plate glass.